In recent years the role of homemaking has been derided and diminished, particularly in relation to careers outside the home. Rather than being encouraged to nurture home and family, parents are urged to return to the workplace as quickly as possible following childbirth. Their place is taken by growing numbers of day-care centres, childcare workers and nannies. The author argues for a refounding of the homemaker's role; revitalizing the traditions of the past with real spiritual knowledge. 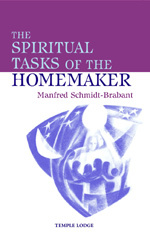 The homemaker can begin to work consciously with the metaphysical aspects of the household, its etheric, astral and spiritual qualities, as well as the various entities connected to the home. He emphasizes the need for an individual forming of the role, as well as the importance of personal development, culture and rhythm. This inspiring and original book provides help, advice and ideas to those seeking to provide a strong foundation for a happy and healthy family and home. MANFRED SCHMIDT-BRABANT was born in Berlin, Germany. He became a member of the Executive Council of the General Anthroposophical Society at the Goetheanum in 1975 and served as Chair of the Council from 1984 until his death in 2001. His service during those years included leadership of the Social Science Section of the School of Spiritual Science, and lecturing around the world on many subjects. English editions of his books include Paths of the Christian Mysteries, The New Mysteries, Thinkers, Saints and Heretics, and The Archetypal Feminine (all with Virginia Sease).